My last five blogs focused on the klesas or afflictions. Knowing what they are, being able to recognize them in our lives, and having tools to deal with them are key to a sense of peace in our lives. My certainty about this comes not just from the teachings I have received, but also from my own experience. Recently, for example, two of the klesas, raga (attachment) and abhinivesa (fear), have created unhappiness in my own life. When I looked in the mirror, I expected to see myself as I looked 10 or even 20 years ago and felt a sense of disquietude as I tried making my outsides match my mental image of myself. Along with the attachment to a past reality, I experienced fear about the changes occurring as I aged. I kept having the feeling something was wrong. And, it was. What was wrong was the avidya (misapprehension) I was having about where I was in my life. Yoga teaches that within each one of us there is something that does not change and has the ability to see clearly. This is called purusa or the seer. When our mind is clouded with erroneous thoughts and attitudes, that is, with avidya such as my misunderstanding of my stage of life, purusa cannot shine forth. We have no clarity, and so are prone to act in ways bringing about unhappiness or suffering. The state of yoga is about coming to clarity so purusa shines forth and there is no avidya, asmita, raga, dvesa, or abhinivesa. Our practice of yoga helps us to develop awareness. With awareness we can recognize when the klesas are active. Then we can be extra vigilant and take action so they do not loom large, causing distress. The possibility of one of the klesas emerging is always within us. Our job is to be able to recognize them when they are acorns, so they don’t grow to be oaks. 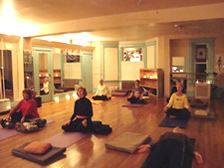 In The Heart of Yoga, T.K.V. Desikachar maintains “the recognition and conquest of avidya and its effects is the only ladder by which we can climb upward.” He explains that we climb this ladder using the tools of kriya yoga – the yoga of action. Patanjali describes three aspects of kriya yoga in Yoga Sutra II.1. The first is tapas, which comes from a Sanskrit word meaning “to heat” or “to cleanse.” We create this cleansing through the discipline of our yoga practice. The second aspect of kriya yoga is svadhyaya or self-observation, self-study. Our work in a yoga practice can help us develop this skill as we constantly ask ourselves how our postures, our breath work, our chanting, visualization, and meditation are affecting us. We also can study important texts, such as the Yoga Sutra, the Bible, or Koran, that can offer us a mirror for ourselves. Through self-observation we come to know ourselves and see ourselves in our relationships. Isvara pranidhana, the last aspect of kriya yoga – the yoga of action – focuses on the quality of our actions. We can never know for certain the outcome of any action we take. By focusing on the action itself, rather than the outcome, we have a better chance of being clear about what we are doing. Once we complete the action, then we must let go and observe the results. In the case of my avidya regarding stage of life, I was fortunate that my yoga teacher helped me to see where I was stuck and offered a practice to help me move toward acceptance and a positive vision of what lay ahead. The teachings in the Yoga Sutra on the klesas help us to understand and recognize the causes of much of our suffering. Our work with kriya yoga develops awareness so we can see the avidya causing our distress. Then, yoga offers many strategies so we may move away from the unhappiness avidya creates toward a clearer, more positive vision of life. checkbox and now each time a comment is added I get three emails with the same comment. Is there any way you can remove me from that service?